Ben Reynolds and Ciara Mageean were among the winners at the Irish Championships in Dublin on Sunday. Holywood man Reynolds won the 110m hurdles title in 13.84 while Mageean clocked 2.02.98 in her 800m victory. Reynolds missed out on gaining the automatic standard for the World Championships, although he should be on the plane to Beijing. Portaferry athlete Mageean said she is undecided over her participation in the World Championships. "I'll have to make a decision, it's an honour to represent my country," explained Mageean after her impressive front-running victory over Laura Crowe (2:04.17) and Ciara Everard (2:07.42)..
"I'll have to talk it through with my coach (Jerry Kiernan), just the way my body has been with injuries, it's something I will have to consider." 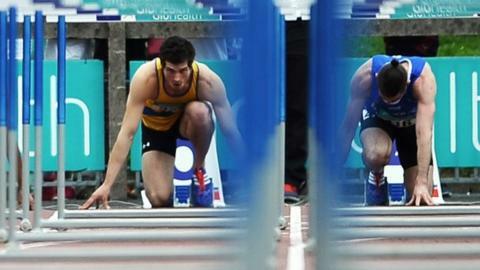 Reynolds hopes to make the Ireland team for Beijing even though his season's best is .01 outside the standard of 13.47. "It would mean a lot in pre-Olympic year to get the nod for Beijing," said the county Down man. "I've been getting faster all year and it would be the icing on the cake at the end of the year." The IAAF have changed the qualification for this year's World Championships with a ranking list allowing athletes a second chance of qualification. Reynolds will be waiting by the phone on Monday when the Irish team is confirmed for Beijing 2015. Elsewhere, Lisburn sprinter Amy Foster had to settle for silver over 100m, losing out to Kelly Proper who won in 11.75, compared to Foster's 11.86. Newcastle's Kerry O'Flaherty completed her preparations for the World Championships, picking up 1500m silver behind Sara Treacy. Treacy may join O'Flaherty in the Beijing steeplechase, qualifying through the quota system - O'Flaherty silver medalled with a time of 4.19.10, behind Treacy in 4.18.62. Banbridge's Emma Mitchell produced a well timed run to take bronze in 4:22.51. Beijing-bound Mark English took his expected 800m victory in 1:50.94 while county Derry long jumper Adam McMullen produced the best leap of his career with a 7.89m mark to take gold although it was over the legal wind limit. North Down's Sarah Connolly won the women's 100m hurdles title in 15.40 with Donegal athlete Mary McLoone completing a double as she won the long jump with a 6.01m leap after her triple jump win on Saturday. There were also medals for Ballymena & Antrim pair Jonathan Browning and Christine McMahon. Browning lifted silver in the men's 400 meters while McMahon easily won the women's 400m hurdles. City of Derry man Conor Bradley gave a game performance to take silver in the men's 5,000m. Annadale's James O'Hare didn't have the legs to claim a medal in the 1500m, running out of gas to finish fourth in 3:57.33.